OK, we have the official forecast here. You are going to be the first to see it. But in the next week we are going to release it on AccuWeather.com for all your friends that aren't paying for the pro site to see. So, without further adieu. We are looking at a much different winter than we saw last year. Some of the highlights of last year include some very chilly air over most of the continent early in the year, from November through December. London saw an average temperature of 7.5 degrees below normal for the month of December, and remember all that snow too. We are not looking like we will see such a cold time this year. That harsh start to the year was from a strongly negative NAO as the cold air just kept coming from the Arctic and would not stop. This year, it looks like we will at least start with a near to slightly above normal NAO, which would show a ridge over western Europe and a trough over eastern Europe. Don't forget that when we do see a ridge over western Europe, we can see some much colder than normal temperature over parts of eastern Europe normally, and it looks like we will have this also. 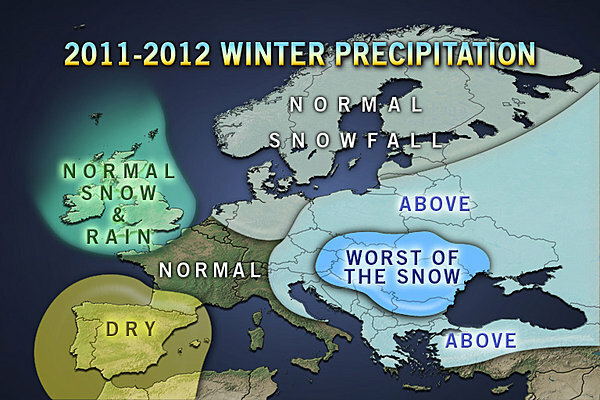 Last year we had some very wet weather over Greece and southeastern Europe. That looks to be at least slightly less than last year, but still a bit above normal for parts of the area. But combine that with the cold air we are expecting, and we will see some much more snow than normal. But let's look closer at the forecast. We are looking at a weather pattern where we see a mean ridge of high pressure over western Europe and a trough digging over eastern Europe. With this trough digging into eastern Europe we are looking at seeing some chilly temperatures over the higher elevations of southeastern Europe, where the opposite will be seen over Spain and Portugal. In northeastern Europe, I had a bit of a tough decision. With the help of Paul Pastelok, our great long range leader, and Jason Nicholls who also does a lot of international forecasting, we are looking at some near to even above normal temperatures are with a blocking pattern trying to setup, especially early in the forecast. The block is from a combination of the lack of sea ice and also some strong trough off to the south, which will also lead to a stronger blocking pattern around. And as we get further into the winter, we are looking at some changes as temperatures try and get milder over some areas like into Italy and even the U.K. as the ridge of high pressure builds. We also try and lose the trough over southeastern Europe, but I think that by that time, enough cold and snow will be seen that even a complete reversal will not matter and it will still average above normal. 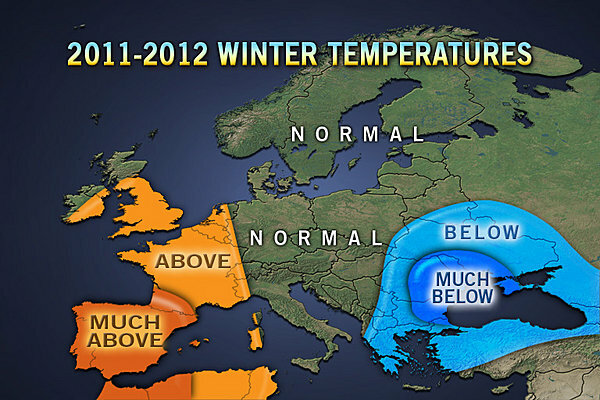 Below is a graphic with our thinking for the winter across the continent. Also note the less snowfall than last winter area over the U.K. and Ireland. This is going to be a key as last year we saw so much snowfall in the London area. We may struggle to see even a few flakes this year in the air down to London. Now, some of the big things to hit on this year will be some threats we could see over the continent from this type of pattern. 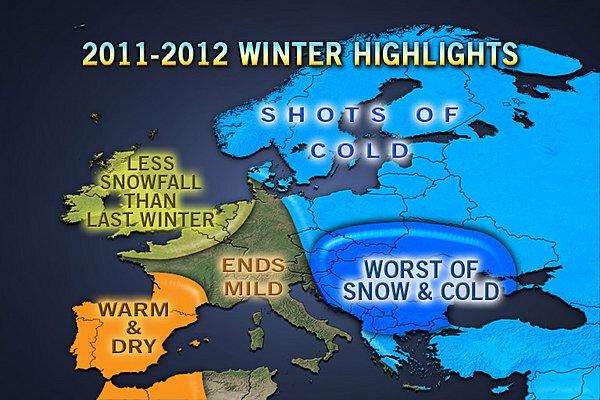 Number one will be the significant snowfall and cold weather over southeastern Europe. Last year we had lots of rain and precip, but temperatures were so mild we struggled to see much snowfall. This year will see less in the way of precipitation, but we will see more cold air around. This trough is likely to last for the entire year, so this may be a big item to look at for the next several months. Number two will be the mild and dry air continuing over Spain and Portugal. If this does happen as we expect, any storms that move in over the U.K. and northern France could bring some stronger winds to the area, and if they do, it may make for a dangerous pattern as the winds could just spark some fires due to the dry weather really continuing. It has been one unrelenting year over that area for heat, and we expect that to continue. By the end of the winter, we get to number three, where we are looking at the ridge building over the area and some mild air pushing into parts of Germany, France, Italy and even farther north for the U.K. and Ireland. So, even though it may be a below normal start over eastern Italy and into Germany, this may quickly get erased by the end of winter with the mild air just flooding in. Either way, below are some images with the expectations for temperatures and precipitation. Remember, it is tough to say snowfall as it varies so greatly due to the water around and into the Alps. A hundred miles can literally mean the difference between all rain along the French Riviera to feet of snow in the higher elevations of the western Alps. So, there you have it. Once the story is posted on AccuWeather.com I will link to it here as it has more in depth info for some things. But you got it here first. bhe avere un inverno in media sia come temperature sia come precipitazioni sarebbe il amx in questo periodo! !cmq vedendo tutte le previsioni a lunga scadenza sembra prevalere una situazione con ingerenza altopressoria nei comparti occidentali europei,quindi per noi adriatici si potrebbe prospettare un buon inverno con una bella dose di fortuna!!!! Sarà l'inverno del centro sud adriatico? ?